The overwhelming dehumanisation of the Rohingya people by unrestrained violence put ASEAN member states on trial for ignoring their plight and tragedy. As a Muslim minority group, the Rohingya people were under attack by systemic physical, structural, and symbolic violence. It has been said that the uprising of Buddhist fundamentalist movements in this region is the face of the legalisation of lawlessness. It seems that this human tragedy is a state-sponsored crime carried out against the Rohingya people. In this regard, the most relevant question is where the ASEAN member states in the midst of this human tragedy are? It appears that the member states of the ASEAN are incapable of taking collective action to the ethnic cleansing of Rohingya Muslim minority group, as well as developing a comprehensive and regionally-relevant response. The Rohingya’s elephant cried silently in the Myanmar room. This is one of the greatest modern human tragedies. Appropriating the notion of homo sacer, Giorgio Agamben used this concept to describe those people that removed or dismissed their fundamental rights as human beings. To consider the Rohingya people as homo sacer implied many things. As Agamben described homo sacer as stateless people, Rohingya people might be easily abducted and killed due to lack of rights and the denial of their citizenship. A worst-case scenario, no perpetrators were held accountable for criminal and moral acts due to their social status. 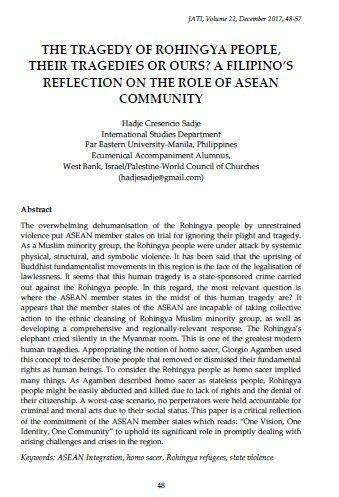 This paper is a critical reflection of the commitment of the ASEAN member states which reads: “One Vision, One Identity, One Community” to uphold its significant role in promptly dealing with arising challenges and crises in the region. SADJE, Hadje Cresencio. THE TRAGEDY OF ROHINGYA PEOPLE, THEIR TRAGEDIES OR OURS? A FILIPINO’S REFLECTION ON THE ROLE OF ASEAN COMMUNITY. JATI - JOURNAL OF SOUTHEAST ASIAN STUDIES, [S.l. ], v. 22, n. 1, p. 48-57, dec. 2017. ISSN 2600-8653. Available at: <https://jati.um.edu.my/article/view/10245>. Date accessed: 26 apr. 2019. doi: https://doi.org/10.22452/jati.vol22no1.4.